Al KARAMEH - More than 30,000 Shuneh residents are now receiving much-needed water from the Karameh Dam desalination plant. After two months of experimental pumping to ensure that the desalinated water is fit for human consumption, residents of Deir Alla in the Jordan Valley started receiving water from the plant last week. The desalination plant, which was officially inaugurated on Thursday, aims to provide one million cubic metres (mcm) of water annually, in an effort to ease pressure on water sources in Shuneh. During the inauguration ceremony yesterday, Minister of Water and Irrigation Mohammad Najjar noted that resorting to desalination is a clear indicator of Jordan’s severe water shortage and depletion of surface and groundwater sources. “In light of the lack of the precious resource, every individual shoulders the responsibility of protecting each drop of water,” he underscored. 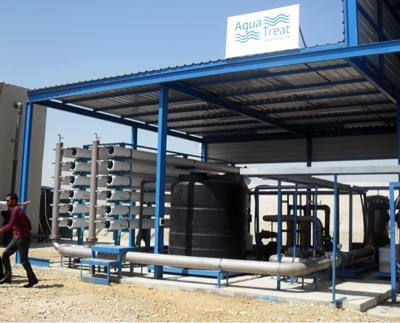 “The project is vital not only because it desalinates saline water but also because it involves the participation of the private sector,” Najjar added. Constructed on a build-operate-transfer basis by a local company, the plant pumps 2,400 cubic metres per day, some one million cubic metres a year. Najjar highlighted that under the project’s second phase, scheduled to start soon, the plant’s pumping capacity will be raised to four million cubic metres per year. Constructed in Wadi Mallaha 10 years ago, the Karameh Dam was primarily designed to store surplus water flow and excess water streaming down from the King Talal Dam and the Yarmouk River. But the high percentage of salinity in the water stored in the dam made it unfit for drinking or agricultural purposes, prompting the establishment of a desalination plant to utilise the stored water. The Karameh Dam, the second largest in the Kingdom, currently holds 18mcm of its total storage capacity of 52mcm. According to officials, water per capita in Deir Alla has increased from 110 litres per day to 130 litres since the plant started operation.